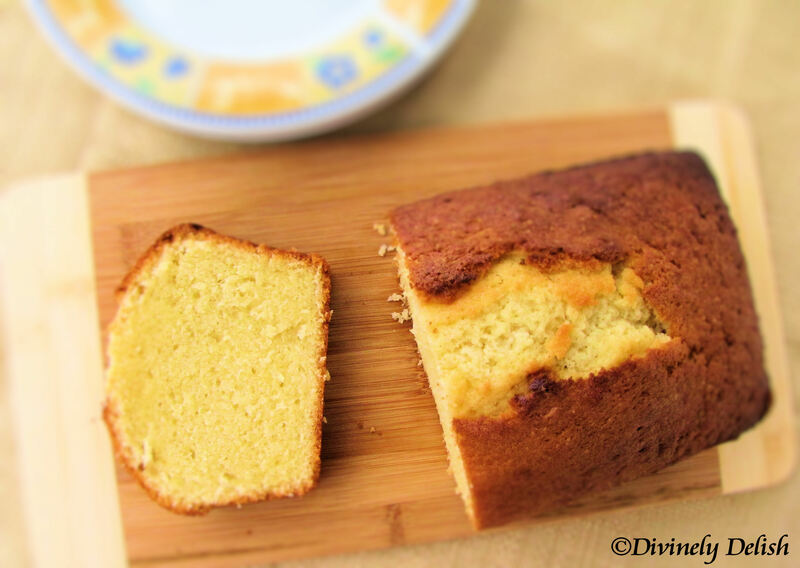 If you’ve been following my blog, you’ll know how much I love pound cakes and butter cakes! For most people, these kinds of cakes are probably nothing to write home about, but I can’t get enough of them (It’s just a slight obsession…really! :-)). These cakes may seem plain, but they are wonderfully moist, have a lovely golden brown crust and are packed with a rich, buttery flavour. There’s nothing like having a slice with a cup of black coffee…Ahh, life’s simple pleasures! 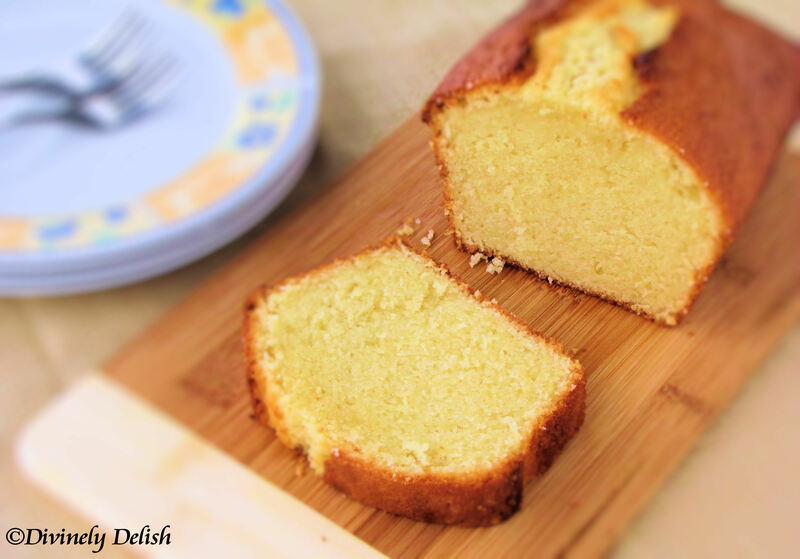 Traditionally, a pound cake was made of a pound each of butter, sugar, flour and eggs. Butter cake is pretty much the same, except there’s usually a higher proportion of butter. I’m always on the lookout for a good pound or butter cake recipe. I’ve tried lots of recipes, and although most of them are decent, I usually find that they’re just not dense and buttery enough. I came across this recipe quite a few years ago, and was tempted to try it after reading the description and seeing the photos. Could this really be the ultimate butter cake?! Although it’s been on my “to bake” list for a long time, I didn’t actually get around to making this until just a couple of weeks ago. I was so excited to taste it that it barely had a few minutes to cool before I was cutting into it and eating the still-hot cake! I did eventually wait long enough for the cake to cool down further before having another slice. My verdict? This is definitely the best, most buttery butter cake I’ve ever made! Note: Castor/caster sugar is a superfine sugar (also known as berry sugar in Canada). In some countries, the granules of granulated sugar are quite large, and aren’t suitable for baking, so it’s important to use castor sugar. However, in Canada and the U.S., our regular granulated sugar is already quite fine, so in most cases, you can just substitute granulated sugar for castor sugar. 2) Lightly grease a loaf pan with butter. 3) Mix the flour and baking powder together and sift. Add in salt and mix well. Set aside. 4) In a large bowl, beat butter and sugar until pale and fluffy. 5) Add in eggs, one at a time, beating well after each addition. Scrape down the sides of bowl and beat until creamy. 6) Add in vanilla essence and mix well. 7) Alternately add in flour mixture and milk/yogurt, mixing until just incorporated. 8) Pour batter into greased loaf pan. Tap pan lightly on a hard surface to distribute the batter evenly. 9) Bake until golden brown (about 40 minutes), or until a wooden skewer inserted into the centre of the cake comes out clean. 10) Cool in pan on a wire rack for 15 minutes, then remove cake from pan and cool. Cake is best eaten slightly warm.